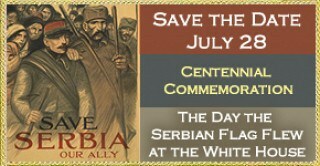 This year marks the 100th anniversary of the alliance between Serbia and the United States, since the US President Wilson's Proclamation of July 28, 1918, when the flag of Serbia fluttered at the White House and other institutions Washington in recognition of the gratitude to the Serbian people and their army for the contribution in the First World War. In the period from July 25 to July 28, 2018, a series of events will be held in Washington DC on this occasion to celebrate this significant anniversary in a solemn ceremony. The organizers of the anniversary celebration are the Embassy of the Republic of Serbia in Washington, the Serbian Orthodox Church in the United States and representatives of Serbian organizations and the Serbian community in the United States. Within the celebration there will be a reception which the senior officials of the Republic of Serbia and the United States are expected to attend. Bishop Irinej of Eastern America will hold a prayer at the US Congress, after which members of the Serbian-American community in the United States will be able to meet with their representatives in the Congress. A symposium at the National Press Club in Washington is planned, with the participation of several lecturers who would speak about the alliance between the American and Serbian people during the First World War, as well as the contribution of the Serbian army and the Serbian people to the great victory. On that occasion the exhibition "Over There, Far Away: 1918 - 2018" will be presented. A concert by the String Quartet of the School for Musical Talents from Ćuprija, Serbia will be given at the Carnegie Science Institute in Washington, and the Serbian Singing Society "Lira" will perform at the Serbian Orthodox Church of St Luke in Washington. Also, the Eastern Orthodox liturgy will take place in memory of the victims of the war at the Orthodox Cathedral of St Nicholas in Washington. The final event would be a gala dinner that will be held at the National Press Club in Washington. The Consulate General is inviting members of the Serbian community in the United States to contribute through their presence in marking this significant anniversary. Program manifestations and other details can be found here.